1. You don’t own your site. When you don’t own your own site, you have no power over its existence or presence. The company can decide to take away your free-dom any time. Your site can be removed for many reasons. When you use free webhosting, you are paying for it by allowing the host to place advertisements on your website. You will have banners and/or pop-up ads on your homepage and/or all of your pages. You will have no control over the kind of ads that show up on your site or how they show up on your website. While there are free hosts that does not force advertising, they tend to close down with alarming frequency due to lack of revenue. When you have your own website, you can even make money from placing your own advertising. Let’s face it, you are telling the world that you are cheap and small fry. For less than $10 per month you can own your own hosting, and for as low as $10 a year you can have your own domain name.Â If you are hosting your business on yourbusiness.freesite.com instead of yourbusiness.com, it tells your potential customers that you don’t take your business all that seriously. It’s not just the visitors to your website, but the search engines will also not take you quite as seriously. 5. Lack of flexibility in design and functionality. Your website will be limited by what templates the free webhosting company offer you. Often you won’t be able to change look and feel easily, change layout, or add interactive features (e.g. plugins, shopping carts, forums, chat rooms, etc.). You get what you pay for — if you find a good webhost, you often get support and reliability. With free webhosts, there is no guarantee of reliability and if you have problems you are on your own. 7. Free web hosting is notoriously unreliable. Free hosting doesn’t have generally have a great reputation for speed, uptime, and availability. They also tend to shut down a lot. Remember GeoCities? That is long dead. Free hosting is only ok for people who don’t care if their site is very available. It’s OK for hobby sites, for testing, but definitely not for business. Most free webhosting providers have tiered services for a reason — usually, once you have a website, you will grow to need more. If you choose a free webhosting provider, you will have to think ahead because chances are you will be stuck with your host unless you want to spend extra money and effort to move it. Start your web presence right to begin with, and you can save yourself from a lot problems down the line. Rather than selecting a webhosting option based on cost, you should really consider finding an option that offers both features and transparent pricing. I personally recommend ASPHostPortal. 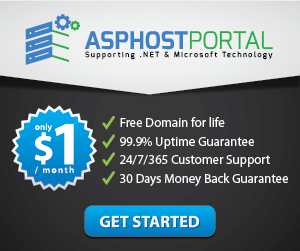 ASPHostPortal has extremely affordable plans starting at $3.81 per month. The price covers everything from 5 GB of local storage for fast performance to a free SSL certification for customer trust to 24/7, 365 support to answer any questions you have about your website. Choosing the affordable webhosting by ASPHostPortal is a much better option for your business than risking everything for free hosting because you will always know what you are getting for the price.